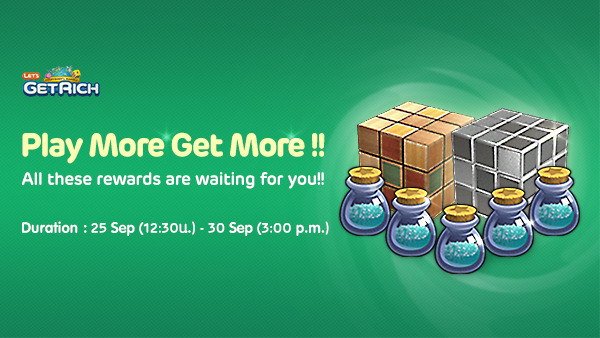 [Event] Play More Get More !! Plus !! More Special for this event!! Rewards in Silver Cube: Gold Cube, 100,000 gold, Card Pack (+30), etc. All these rewards are waiting for you!! Mystic Powder is an item that helps you to get more rewards from a cube. You can get the Mystic Powder by "open cube now". *Tip: Don’t Forget to open with Mystic Powder to get more and better rewards! Especially in this event period, you will get up to 3 items! Play More Get More Everyday!! Fun with us and go cheer for Asian Games! *เคล็ดลับ: อย่าลืมใช้ผงลึกลับในการเปิดลูกบาศก์นะ จะทำให้ได้ของที่ดีขึ้น และเยอะขึ้น!! โดยเฉพาะในช่วงกิจกรรมนี้ คุณจะได้ของเพิ่มเป็น 3 ชิ้น!